If you have viewed or shared a news story on Twitter recently there is a good chance you have seen a Twitter card. News sites are using them as part of their Twitter strategies to drive traffic to their site. 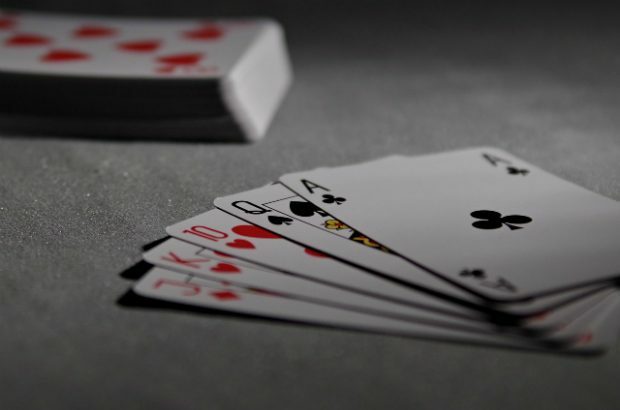 This post will make sure you hold all the aces to achieve your communications goal with Twitter cards. A Twitter card combines content with a link to create a post resulting in a higher engagement rate and a higher click-through rate thereby supercharging your tweets. Twitter cards achieve the higher click rate by virtue of the expanded link selection area. You can also make a card that will appear automatically when any tweet using your URL is pinned or clicked. You can do this by embedding some simple HTML code from Twitter into your campaign sites (there are also plugins like Twitter Card Meta for WordPress based sites). Twitter has a fantastic web developer guide to help you implement the URL cards. The summary card can have useful applications for your web content by giving users a quick preview of the content before they click. This should increase click-through and reduce bounce rate by informing the user prior to the click. Various studies have shown that using an image with your tweet can increase engagement by as much as 35%. This can help make a tweet containing your URL stand out when it is expanded or pinned. This card can have a multitude of uses in addition to making that image, audio file, gif, Vine or video work on driving even more clicks. It is a great way to host your rich content and showcase what your website can offer to users. An example video player card for the Get In Go Far campaign. There are further card types that can be created within the Twitter ads platform and can be posted for free or promoted to a larger audience. You have to enter payment information to get access to create cards but you don’t have to pay to create and post cards unless you select to promote them. These are similar to the URL summary card with a large image. Using a large clickable image goes one-step further and increases your click-through-rate. 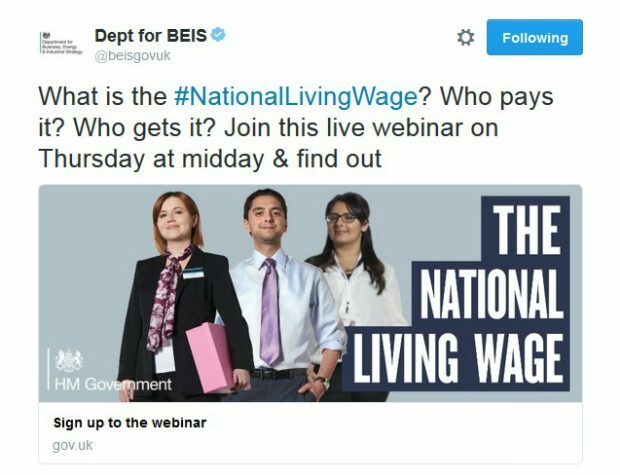 At BEIS we have used these to help drive employers to webinars and guidance as part of the National Living Wage campaign. An example website card for the National Living Wage. Are you an app developer or do you have an app you want to integrate more into your comms strategy? You can increase downloads with an App card. This card enables users to directly download your app from either the App or Google Play stores in a click. 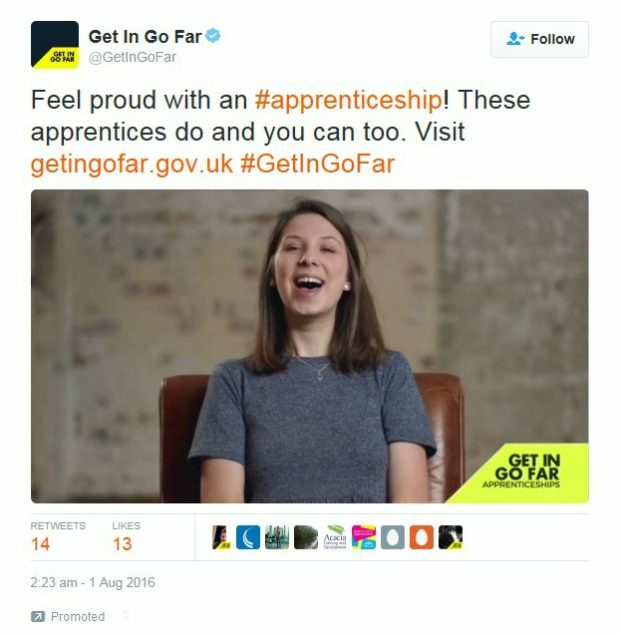 You can add a photo or video to promote downloads of an app your organisation has developed or for government departments, a government supported a 3rd party app. Once your audience has the app it is another comms channel you can directly use for messaging and information. Pairing this with paid for advertising targeting specific devices could lead to a real growth in users. Do you need leads? A lead card is designed to help you securely collect emails from an interested tweeter in only 2 clicks. These cards have a multitude of applications from setting up quotes, consultations, newsletters, building email lists and more. Twitter provides guidance on the different specs required for each card, such as character limit and image size. Follow this advice and ensure you and your organisation can have royal flush instead of playing 52 card pickup when it comes to engaging on Twitter. Feel free to DM me @GarethRiceJones or comment below if you have any questions or want to let me know how well cards have worked for you.